Making the cockpit presented a really tough challenge. First, the work space is limited, so working inside the cockpit "tub" often required a "scrunched up" position -- hard on the knees and back. Second, the number of items to be manufactured is daunting. Third, detailed documentation and pictures are hard to find. Fortunately, I did have one really big advantage ... I found and bought a cockpit simulator. Therefore, I had a good template to work from. The simulator section was far from complete, but it did contain the essentials that made it useful as a cockpit procedures simulator. Most important, the ejection seat was at least usable as a base. 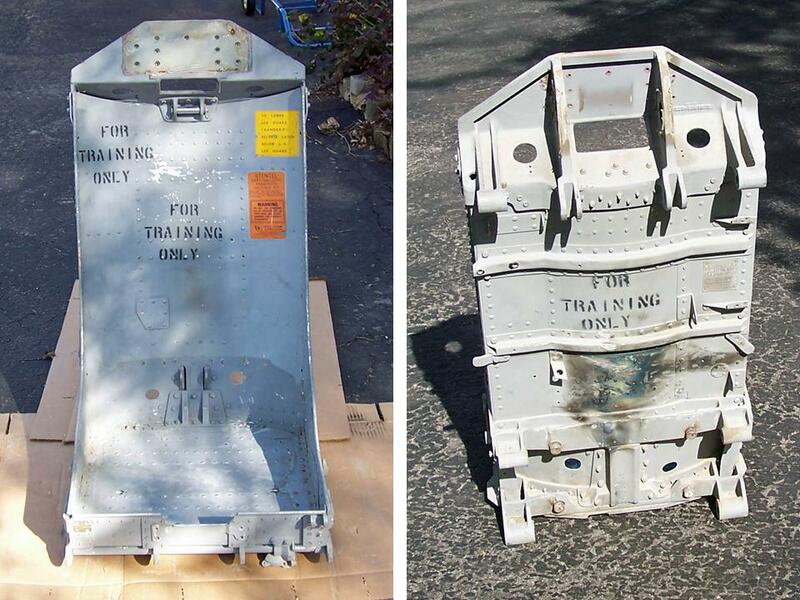 (As we discovered, the ejection seat was not meant to be ejected -- several stencils indicated that it was meant "FOR TRAINING ONLY" and removing the ejection seat from the simulator turned out to be a three-day job that included cutting some heavy retaining plates.) There were, of course, no side instrument panels, no center pedestal, no rudder pedals, and so on. Never mind all that ... we had a great starting position that gave us accurate measurements for the major cockpit components. After getting a good "feel" for the cockpit layout through the modeling work, I traced the major components on the aluminum sheet. 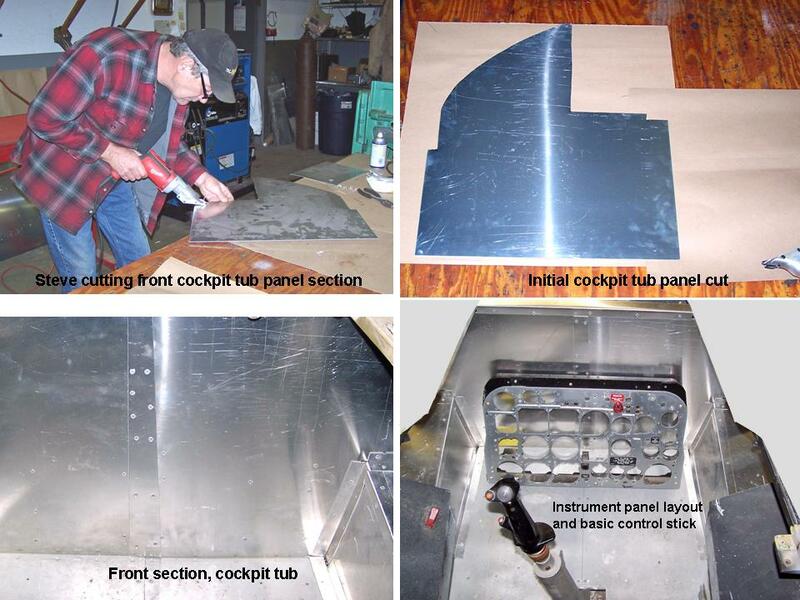 Figure 1, cell 02, shows Steve cutting the first cockpit tub panel, the completed panel, and the completed bottom front section of the cockpit tub. 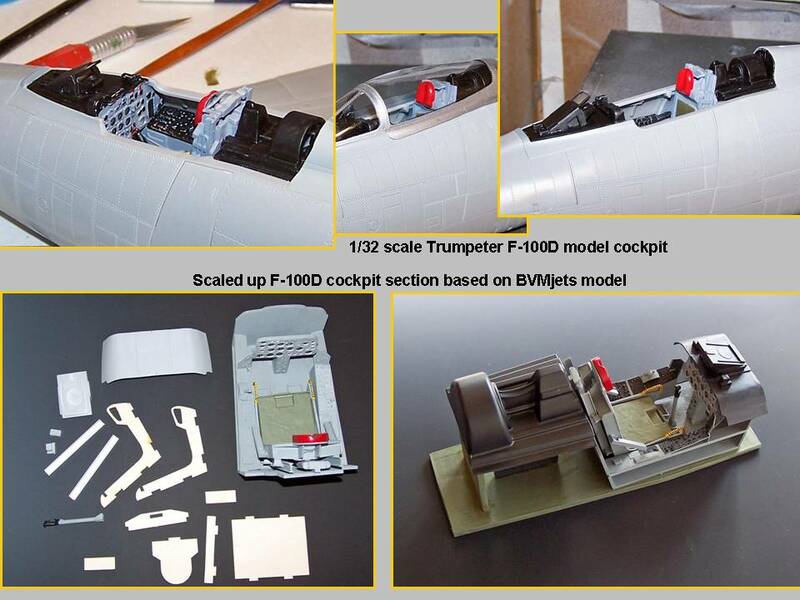 The lower right-hand corner of the picture shows the basic tub layout ... and the new instrument panel frame that will become the base for the flight- and engine-instrument installation. 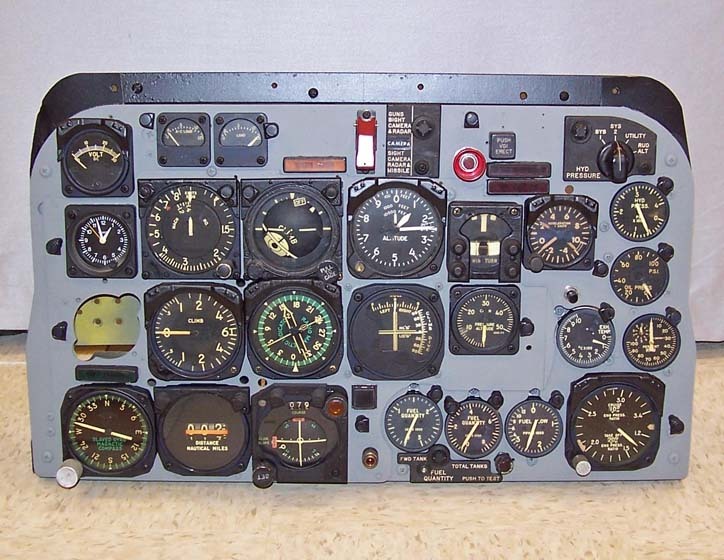 I had no knowledge of the actual layout of the space behind the instrument panel ... but I did not consider it necessary to worry about what was likely to be a tangle of ducts and wires in an actual aircraft. This "model" is for display purposes only -- and you won't be able to actually see what components are housed that far in front of the cockpit section anyway. My philosophy is simple: if you can't see it, it doesn't need to be there. 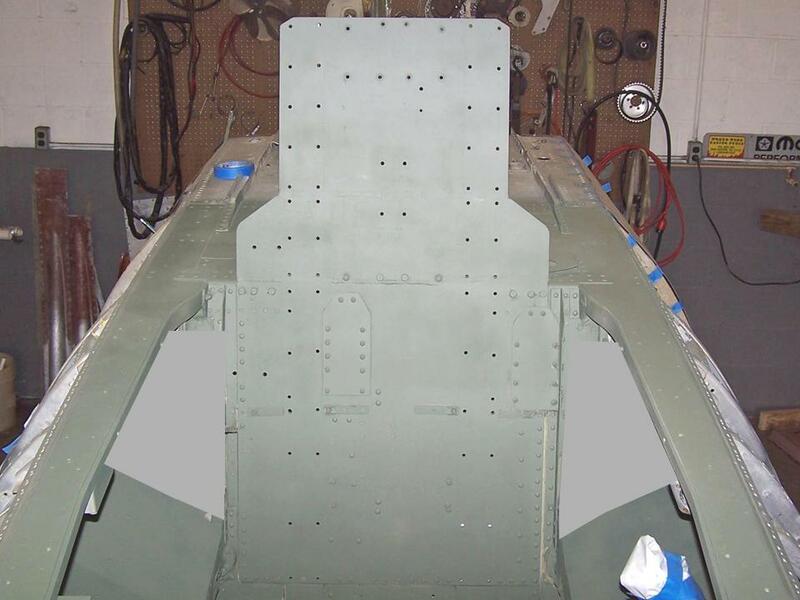 While the work on the cockpit tub and the instrument panel was progressing, I was busy with the ejection seat. First job: to get the armor plate behind the ejection seat ready. (The ejection seat fits against this plate.) 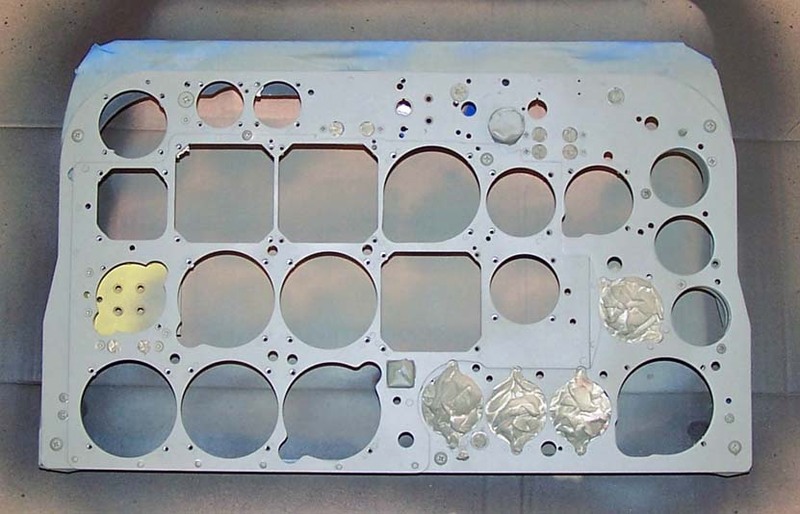 Figure 2, cell 01, shows the new armor plate with its first coat of self- etching primer. The armor plate has already been bolted to the frame. 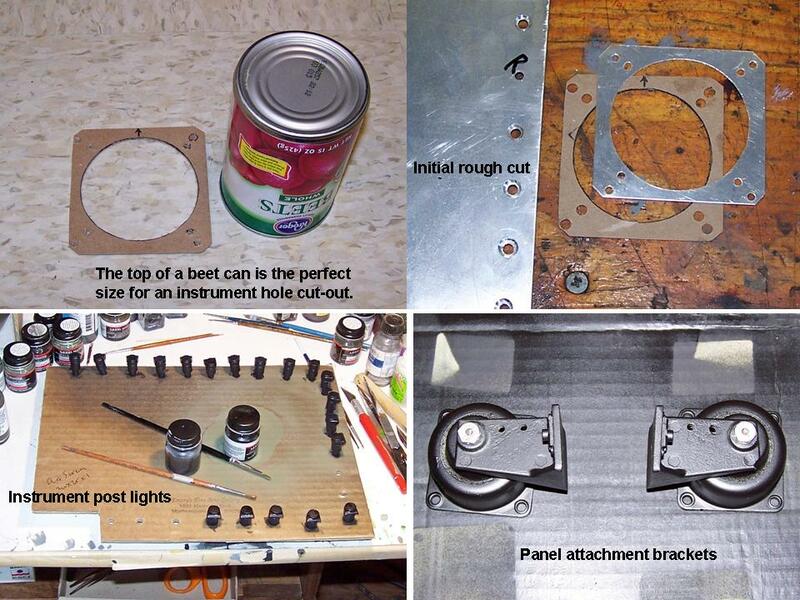 Note that the holes in the back of the plate will serve to anchor the ejection seat rails. Next, the ejection seat rails had to be made ready for installation. 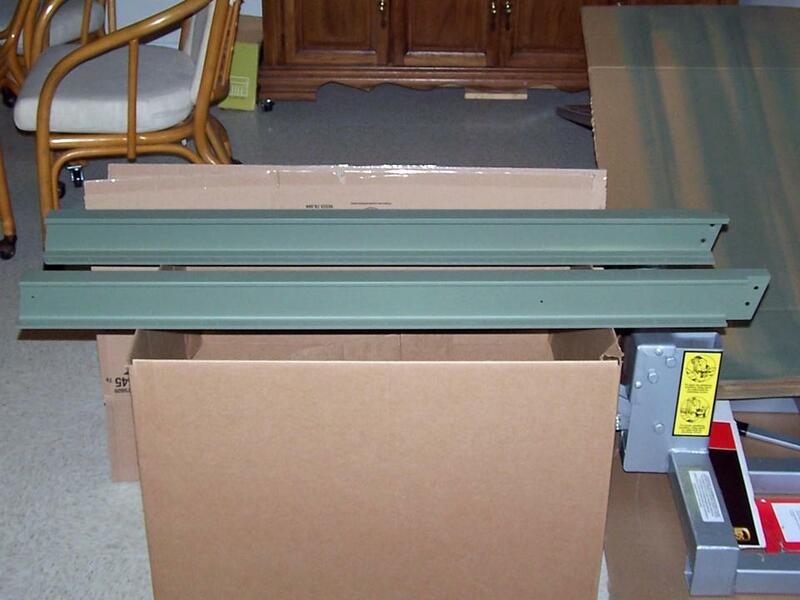 Basically, these rails are small I-beams. Figure 2, cell 02 shows the two rails in their initial coat of self-etching primer. There will be six steel rollers attached to the ejection seat that will fit against the inside I-beam track. The big pieces you see in Figure 2, cells 01 and 02 were the easy part. The ejection seat has many small parts and those had to be worked on. 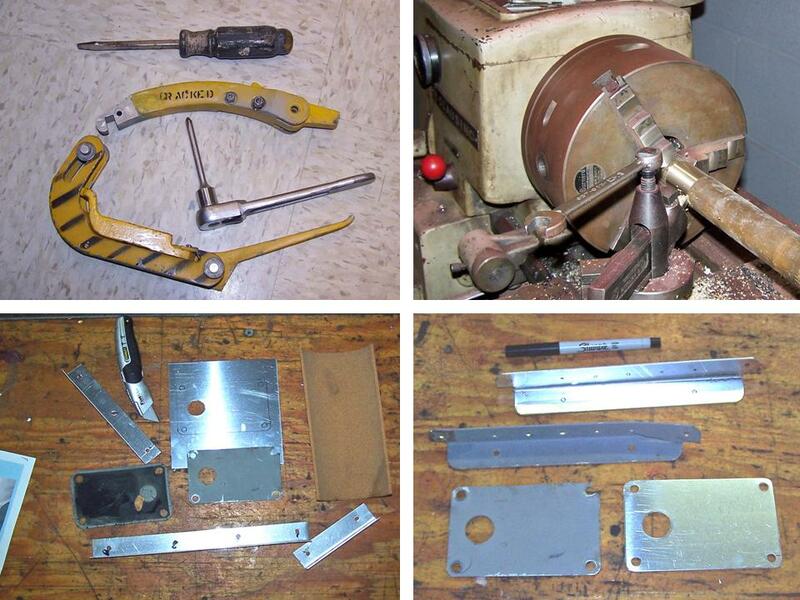 Cell 03 shows a collage of a (cracked) ejection seat handle, some damaged pieces and their replacements. 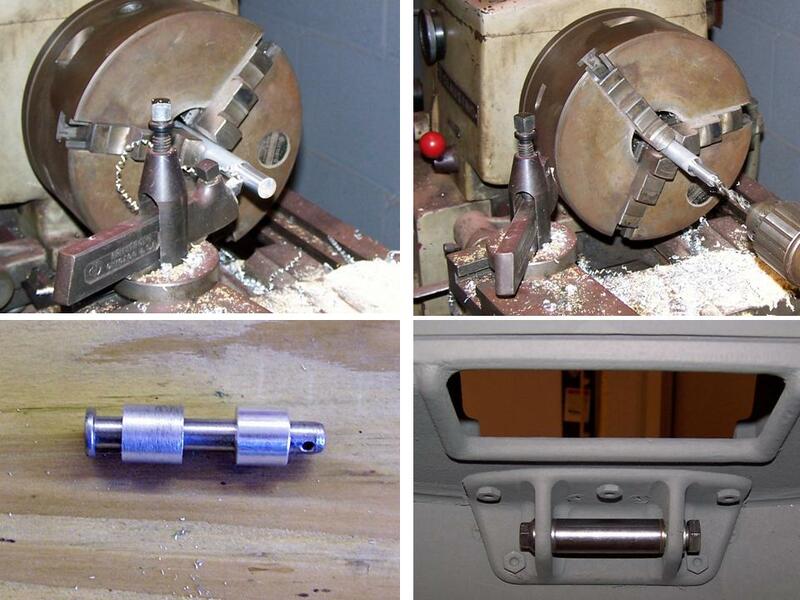 Steve and I wound up making a lot of new parts to replace the damaged or missing pieces. The simulator included a "for training only" ejection seat you see -- front and back -- in Figure 3, cell 01. Not quite the real deal, but close enough. (The back of the seat pan shows some damage caused by a cutting torch.) 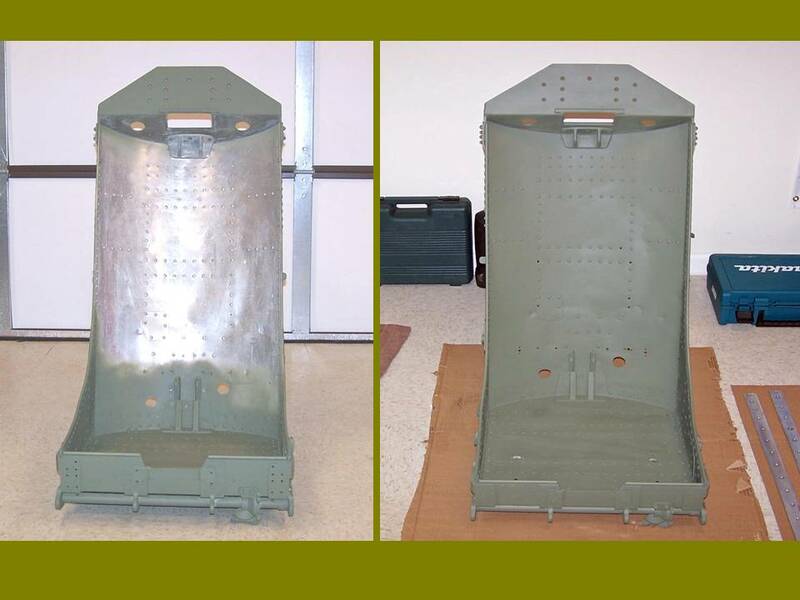 The two pictures in Cell 02 show the cleaned, repaired, and partially primed seat pan on the left and the fully primed seat pan on the right. The next layer of paint will be a zinc-rich gray primer and the final coat will be a color-matched acrylic gray. In the meantime, I really wanted to see some nicely-finished components. The result is the eye candy you see in Figure 3, cell 03. 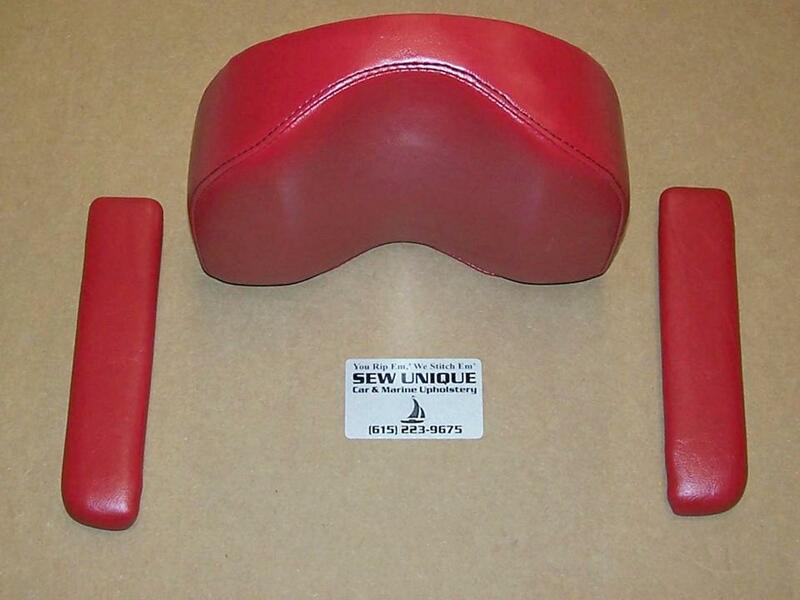 The leather work involved in the manufacture of new red leather arms rests and a new red leather head rest was well beyond our pay grade, so Steve introduced me to John VanDerWorp, the owner of a custom car interior shop known as Sew Unique. (I have included the business card for this business and you can read its details if you click on the picture and then maximize it.) As you can tell by looking at the picture, John did a first-class job. Working on the cockpit is never dull, because there are many different components to work on. Figure 4, cell 01 shows that there are ejection seat parts to be made. Steve's machine skills are always available and they are, as you can see, well-honed. Figure 4, cell 02 illustrates why I spent so much time on the instrument panel. Fortunately, the top of a beet can is just the right size to serve as a template marker. (The text in this composite picture describes the action.) Cell 03 shows the result of many months of work ... the next step will be to install the intrument panel in the cockpit tub.